I'm usually a classic makeup girl--NOT TODAY!! In this reinvented post, I'm channeling a makeup look that has an air of robotic, alien and tribal. I'm still keeping true to my minimalist self (I swear I'm not naked in this pic) and keeping the focus on the features, using bright highlighter pink and silver hardware to bring them to the forefront. My face and nose are heavily contoured to give it that extra-terrestrial appearance and my brows are fully filled-in using brown eyeshadow. I know there are girls out there who'd easily wear this look on Valentine's Day, so I created this one with the daring souls in mind :) For the traditionalists like me: simply change the pink to a neutral taupe and you've got a wearable party ensemble, perfect for a celebratory outing--even Valentine's, depending on where you're going! Using a hot pink sticky base (NYX Cherry) on a flat brush, outline your crease, wing it out and create a parallel shape above the crease. Fill it in using the same base. 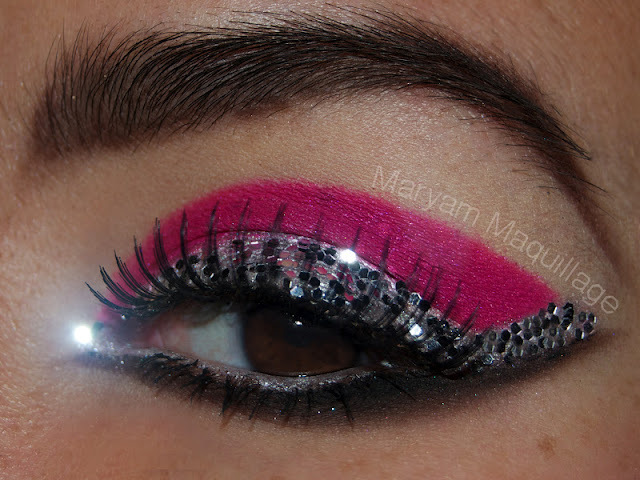 Apply a bright pink matte eyeshadow on top of the sticky base. My e/s came from the 88 palette. 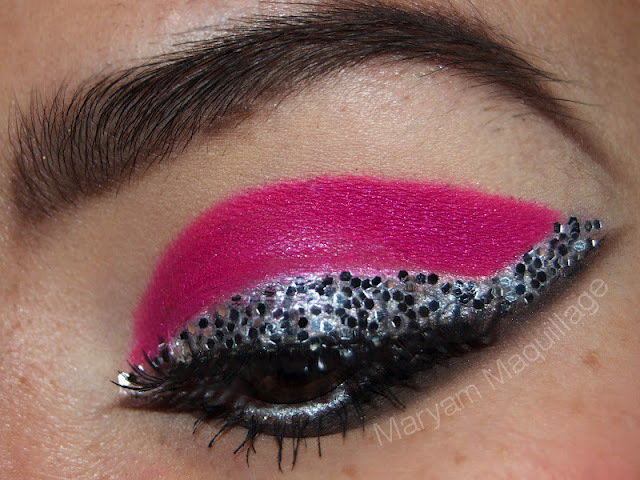 Also, add a shimmery pink pigment to the center of the shape (MAC Fuchsia). Fill in the empty lid part and wing using a silver chrome eyeshadow on a flat brush. 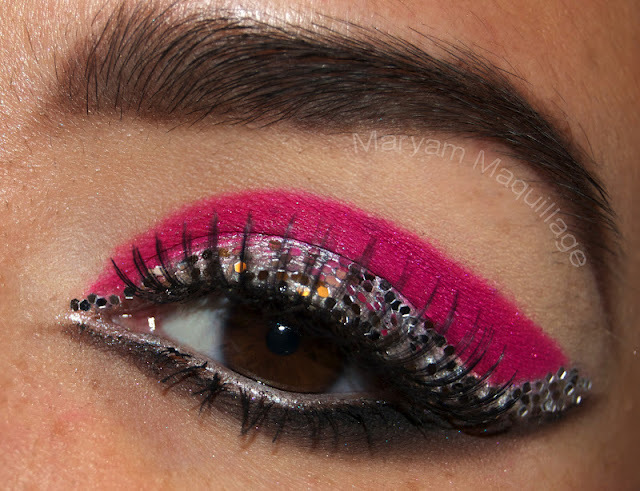 Line the bottom water line with a silver eyeliner or eyeshadow (NYX Cottage Cheese). Apply a dark brown eyeshadow under your lower lash line and under the silver wing. Sharpen the transition between the brown eyeshadow and silver water line with a black gel liner on a fine brush. Apply clear lash adhesive all over the silver eyeshadow on the lid and wing. Wait 20-30 seconds for the lash glue to become tacky and press the glitter onto the adhesive using a small brush to pick up the glitter. Make sure you keep a paper towel underneath to catch the glitter fallout. Apply your falsies and mascara and you're good to go! I've seen a couple other beauty bloggers using chunky craft store style glitter, but this glitter "liner" is my very own creation. I'm eager to wear this look to a dance party and be my very own disco eye-ball!! Editor's Note: Although I'm using craft store glitter for this conceptual makeup look, I do not recommend using it if you're planning to wear it out. Cosmetic grade glitter is smaller, but it is much safer for the eyes and doesn't require surgeons' hands to properly apply it. Using any type of chunky glitter, rhinestones, pearls or decorations for cosmetic purposes demands professional skill and knowledge. A special thanks to all my readers for your continued support of Maryam Maquillage! I am immensely grateful for each and every one of you and I can't express how much I value your words of encouragement. Your positive energy and feedback keeps me going and feeds my creative spirit. Thank you so much guys!!! Now, that's pretty cool its very creative. You really are one great, fabulous & successful beauty blogger. You are certainly creating wave after wave - except that each new wave is bigger & better than the previous one. Hopefully the waves will continue to grow in size and soon become indestructible typhoons, tornadoes & tsunamis( purely in respect of creativity,power,force,form,energy). This new look eye make up is truly extra terrestrial - stunning hot & out of this world.You are the most beautiful awesomest creature to invade planet earth in recent times! Have a great year ahead. Wishing you every success. Amazing! I don't know that I've ever seen that shade of pink THAT pigmented look good and actually "wearable" before. This is awesome! WOW this look is so high fashion, you look like you should be on the cover of a magazine! I just love this look, so fun! AMAZING! you look like a movie star Maryam! Maryam, you comment couldn't be any sweeter. You really just made me smile. <----so jealous! Your eyebrows are perfection. omg this looks truly amazing!! my god love your brows! they look so perfect! WHAT THE WHAT!? This is CAH-RAY-ZAY! I love the new you just as much as I loved the old you. And that's quite a lot! This is really cool and I love how your bun looks with it! HELLO hot femme bot! This is so bold and daring but you Maryam have the perfect face to pull it off! Holy moly!! I just had a weird foot spasm-kick happen from the excitement! It's so unique. Haven't seen glitter like this and I love it! Wow very creative!! I love it!!!!!!!!!!!!!!!! OMG! Please do a tutorial on this. That is just stunning! Yes, yes, yes, it's in the works!!! AMAZING make up..please please teach me..I m unable to do even the easier things..!!! You look absolutely stunning hun..With glitter eyes and bold pink lips..Absolutely different from your other look..I love it.. Trying something new is challenging..
Oh I LOVE this look! 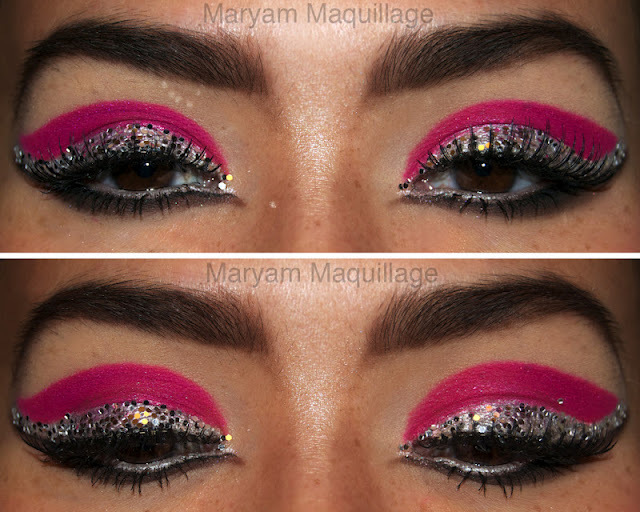 You have to throw a disco party just for this look! Gorgeous, mami! Beautiful look as always, but **please** don't recommend using craft store glitter. Craft store glitter is not approved as eye safe because it's not cosmetic grade. Cosmetic grade, eye-approved glitter is rounder and much smaller in terms of size so if it gets into the eye, it isn't harmful. Craft store glitter is cut more harshly and the size can scratch your cornea if the glitter gets into your eye. On a few occasions, as a makeup artist, I have been doing makeup in large group settings and I've seen a few people who were doing their own makeup end up suffering eye injuries from trying to use craft store glitter in their eye makeup looks. The risk of damage isn't worth it, as our eyes are so very precious. omg you are so right Mandy!!! I'm gonna make a correction right now!! Thank You!!! you are so sweet :))) Thank you so much for such a lovely compliment!! OMG I love this bold make up look! IT's so beautiful! it's not me, it's the makeup!! makeup is maaaagic lol :)) thanks love!! This is freaking HOT!!! Seriously, I had an "OMG" moment when I saw the first picture. Congrats on the new domain! I am so happy for you~ I wish you the best!! Woha! You're one talented lady! This is just mesmerizing! I love it! Super groovy lips! I am so incredibly impressed! The glitter application is perfection; every thing right in place! Wow that is a work of art!! !